Announcement Many items are in-stock and will ship within 5 business days, except during the holiday season (November through February), when items may take up to 3-4 weeks for production time. If there is any expected delay, we will notify you immediately. Many items are in-stock and will ship within 5 business days, except during the holiday season (November through February), when items may take up to 3-4 weeks for production time. If there is any expected delay, we will notify you immediately. The feel of silk is incredible. Those knickers are so comfortable and are gorgeous to boot! From today's sewing table... There's only one of these left, in a size small! One of our most popular knickers: Antoinette! Any of our corsets can be customized to fit your exact measurements! We recommend this option for customers who are full bust, plus size, very tall or petite, etc. This photo shows a mock-up toile which will be used to check a custom pattern's fit. Angela designs and sews all of the samples for new collections in house. All of our pieces are handcrafted in London - usually just one at a time to order! From sourcing materials to design to sample-making to final production, the whole process happens locally. Just another busy day in the studio! Rihanna in an Angela Friedman corset! Many other celebrities like Gigi Hadid and Eva Green have also worn our pieces. 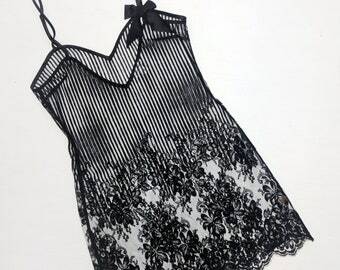 Angela Friedman's decadent lingerie line: French lace, silk, and frothy ruffles will make her feel indulgent and luxurious! Angela Friedman lingerie bridges the gap between an opulent dream world and your everyday wardrobe, with the beauty of 100% silk and French lace. Our designs are handcrafted to feel like a dream against your skin. It's time to start putting only the finest materials and craftsmanship against your delicate skin. You deserve lingerie and lounge wear that feels like it was made just for you. Angela Friedman's vintage-inspired designs feature only the most decadent silks and French laces, handcrafted into dramatic garments that will make you feel like royalty. Our quality materials are paired with an acute attention to detail that's unparalleled in your local department store. The designer's previous work in the delicate world of ballet costumes has inspired many of her design details and the feminine and indulgent feel of the line. Her theatrical roots have translated into collections that tend towards opulence, bringing much-needed sophistication to the lingerie industry. Angela creates each of her samples by hand in her private atelier, and all of her designs are ethically manufactured in London. To return an item, you must contact us before sending your item back! To process your return or exchange, you must contact us within 7 days of receiving your item, and we must receive the item within 30 days of your receipt. After that point, we are unable to accept a return. Buyers are responsible for return shipping, and will not be reimbursed for any shipping charges in either direction. Ready-To-Wear sized garments (including bras, garter belts, slips, gowns, robes, lounge wear) are returnable (less shipping and fees), provided the items are still in new and unworn condition. That means tags intact, no stains, no smells, etc. Rush items are not returnable, and we cannot accept cancellations on these items either. Once we agree to take on a rush project, work begins right away, so we will not be able to refund you. Please contact me prior to checkout if you have any sizing concerns. Your items are made-to-order, so if you order the wrong size and return it, it can be difficult for me to re-sell it. Please be kind! I am not responsible for incorrect measurement information given, or measurements that may change due to weight gain or loss, pregnancy, or otherwise changed bodies. We accept Paypal and credit cards (Etsy direct check out) to process payments. Please contact us with any questions about payment before placing your order! Unfortunately I cannot accept cancellations on made-to-order pieces after payment has been posted - at this point I will be purchasing materials and beginning work, so payments are nonrefundable. If the item in question is already in-stock (contact me in advance if you're unsure) and has not been shipped yet, we can cancel it for you if needed. All payments and required communications (measurements, design choices, shipping addresses, etc) must be made within 6 months of initial purchase date. All garments must be claimed (picked up in person or through the post) within 6 months of initial purchase date. All garments unclaimed and transactions not finalized after 6 months will be forfeited at that point. Our prices include 20% VAT (sales tax) for all customers. We cannot change, deduct, or refund tax payments, so please do not ask us to. We are just trying to be compliant with local laws and regulations. :) Thank you for your understanding! All items ship via the Royal Mail or DHL from London. All larger items (gowns, robes, large multiple pieces, etc) will ship in cardboard cartons. All smaller items (accessories, bras and knickers, shorts, etc) will ship in waterproof envelopes. Transit time is 2-5 business days within the United Kingdom, and may be up to 2 weeks for the rest of the world. Processing times may vary depending on the item - Most items ship within 5 business days. Some specialty items are not kept in-stock and will have to be put into production. This may take up to 2 weeks, but we will always keep you updated of the status of your order. If you are in a rush, we can suggest in-stock substitutions for your order. Please note that our processing times during the holiday season (November through February) can be as much as 3-4 weeks. Contact us right away if you have any concerns about the arrival date of your parcel. Clients worldwide - Yes, I can ship to you! Contact me for pricing and details if you are unclear. Please check with your local post office to determine if there will be any import tax due upon receipt of your items. You are responsible for paying any customs fees on your end - no items can be marked as "gift" for customs purposes. If any parcels are returned-to-sender, due to a customer refusing the package or not picking it up at their local post office, we will not re-ship it to you until you pay the actual shipping fee again. If you don't want to re-ship it, we will charge a 20% restocking fee. Custom size/style orders will not be refunded at all if returned to sender, as they are not returnable.